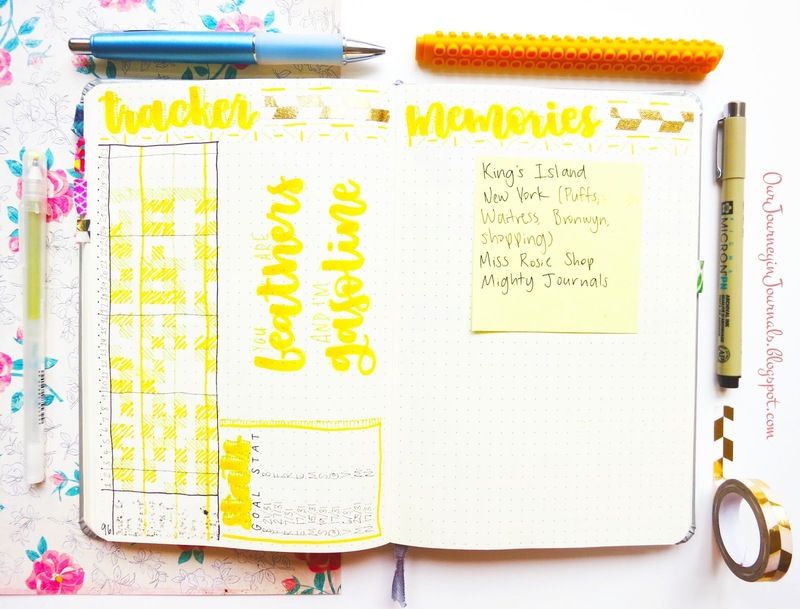 The basic bullet journal spreads for planning are absolutely essential if you're in school. You'll first need a key. 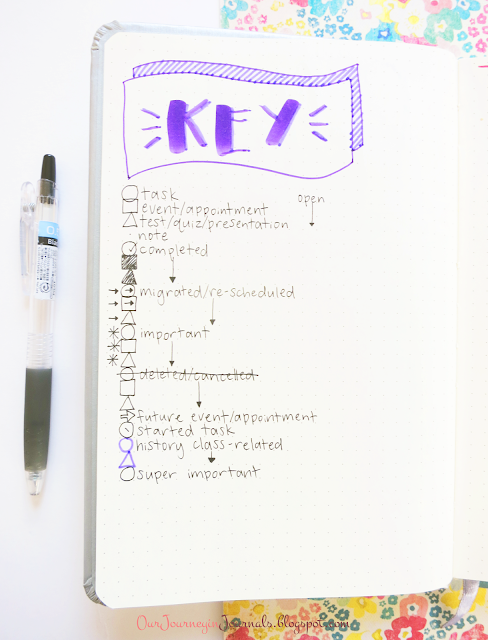 You can just start out with the original system's key, but the beauty of the bullet journal is that you can also customize it and adapt it to your own unique life if you want to! I changed up some of the symbols to fit my own personal preference, and I also made sure to add a "test/quiz/presentation" and "future event" symbol. I often use the latter to add details that teachers give about future tests and quizzes, such as their format or how many questions they'll have. I also had a mini color code last year where anything written in non-black ink meant that it was related to my hardest class from last year (AP world history). I don't know if I'm going to continue with that color code this coming year, but I can just change if I need to (since bullet journaling is a super flexble system). You could also add an "assignment/project due" symbol, though I personally find it unnecessary as a bullet. Also, some people like to have a full out color code where they use a different color for every course and separate facet of their lives (such as a sport or job). However, I would dissuade against this because it takes up a lot of time and just makes writing in your bullet journal a complete hassle. Nonetheless, don't be afraid to change up your key to reflect and adapt to the various changes in your life as a student. The four basic type of bullet journal planning layouts are daily spreads/dailies, weekly spreads/weeklies, monthly spreads/monthlies, and future logs. Dailies are your everyday task lists and agendas. This is typically the main place where you'll be using the symbols from your key. If I can, I try to make my daily spread at night (though it tends to happen in the morning before school starts), and I write down all of the next day's tests/quizzes, various events, and tasks (like homework or studying) that I know I'll need to do using their corresponding symbols. Writing down my tests, quizzes, and events in my daily spreads ensures that I'm prepared and don't forget about the different things I have to do that day. I also add in tasks throughout the day as homework is assigned. I myself don't use weekly spreads during the school year, but I believe that a significant amount of people who do use them generally don't have daily spreads; they basically use their weeklies as already set-up dailies that are all in one place (and also sometimes include things like trackers or meal planning), so it would be redundant to have separate daily spreads. In terms of which one you should use if you're in school, I would suggest using weekly spreads if your workload tends to be pretty much the same throughout the week and if you need lots of future planning within a week. On the other hand, I would suggest using daily spreads if you have quite varying amounts of stuff to do on a day-to-day basis and you like the freedom of not having a pre-made spread for the entire week. Of course, there are also many people that use weekly spreads purely as a place to future plan instead of a to-do list - a place where you can put down your due dates, scheduled tasks, quizzes/tests, meal planning, events, etc. for that week - so that you can transfer those previously scheduled things plus your tasks for the day into daily spreads. This is a method that efficiently incorporates both dailies and weeklies. Monthly spreads are pretty necessary for most people. This is where I write down when my quizzes, tests, project due dates, and other scheduled events are. I also sometimes use my monthly spread to schedule tasks. Additionally, I have a "miscellaneous" column where I can put random tasks I want to get done sometime throughout the month (but not on a specific day) or notes that I want to easily find in the future, such as the number that I needed to use to access my AP exam scores two months after I actually got the number. The last primary planning spread in the bullet journal system is the future log. They typically last for six months, and I've found this to be pretty sufficient. If there actually is something that goes beyond this, I put it at the bottom of the spread with the last month if it's something that I'll actually forget. Here, I write down things like tests and due dates that are beyond the current month, school breaks (which I put an asterisk by in order to make them stand out), holidays, and birthdays. I use the standard future log from the original system, but there are a lot of different methods out there. 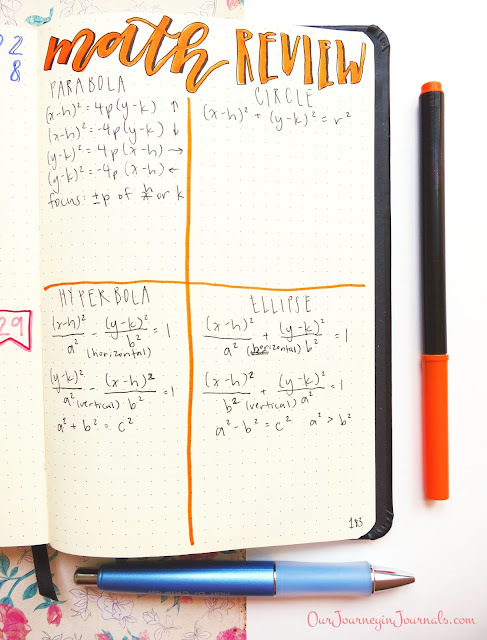 These are all bullet journal spreads that I would suggest making either before the school year even starts or sometime at the beginning of the school year. 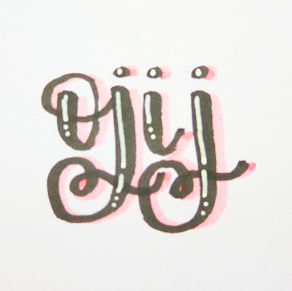 Of course, make sure to take everything I say in this post with a grain of salt and adapt your bullet journal to your own needs; even though these are things that I recommend, I myself don't use all of them just because I feel like I personally don't need them. 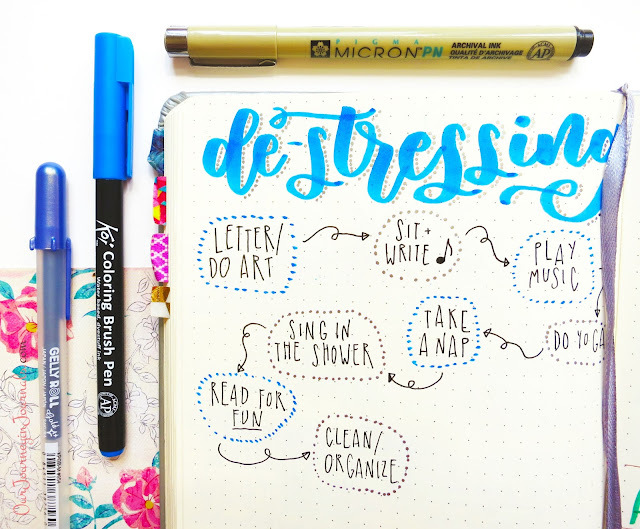 That's the beauty of bullet journaling; you can adjust your system and spreads to your own life! 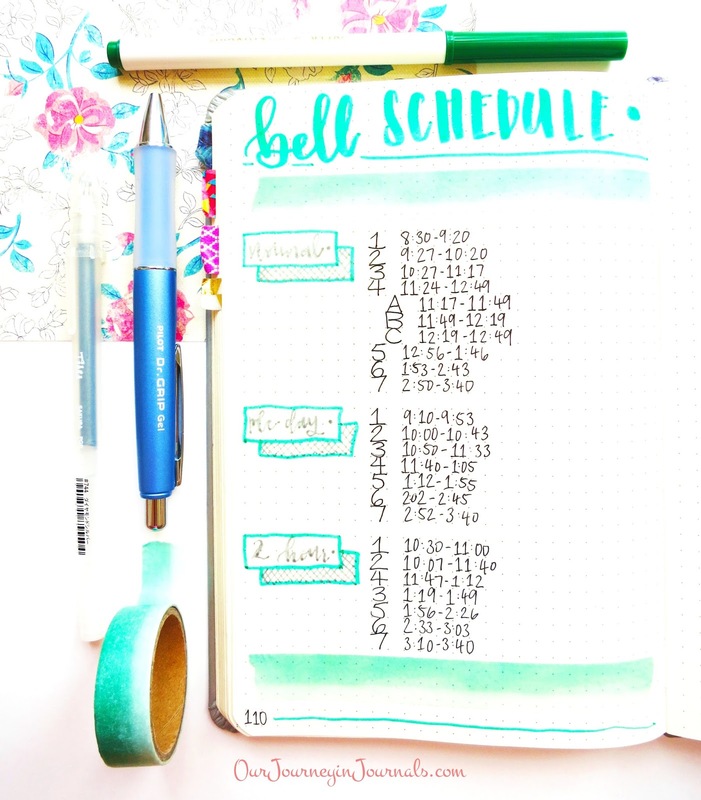 This is another staple in your bullet journal for students: your school's bell schedule if you're in high school or your class schedule if you're in college. If you go to a typical American school (or something similar elsewhere), you can usually memorize your class schedule within the first couple of days, but the bell schedule tends to be more difficult to learn the exact minute that each class starts and ends - and I know we all want to know precisely when class ends. If you're a college student, your schedule is probably pretty funky, especially since it'll vary from day to day. 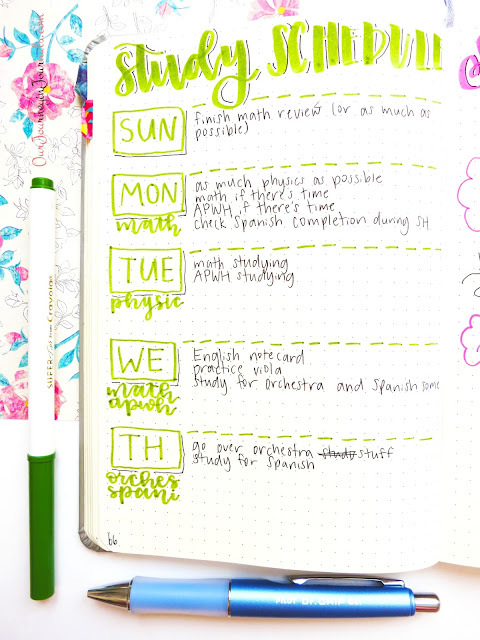 Creating a spread that lays out your schedule for the entire week - including the time, specific room and building, and teacher - will be super helpful, and you could also schedule in when you'll have your meals or dedicated study breaks between classes. The two simplest ways to make this layout would either be 1) doing what I did for my bell schedule spread pictured above, or 2) creating a time schedule chart kind of like this. I'm not in college, so this doesn't really apply for me, but I've heard that having teacher contact information on hand is super convenient. This includes their email, office hours, etc. Having all of this stuff in one place (i.e. your bullet journal) is always a good idea for university students. Depending on the way your school works, these are both good spreads to make and later reference. I would put big things like school breaks, dates of midterms and finals, when class registration opens for the next semester, competitions/concerts and practice/rehearsal schedule, standardized testing dates, etc. organized sequentially by month. 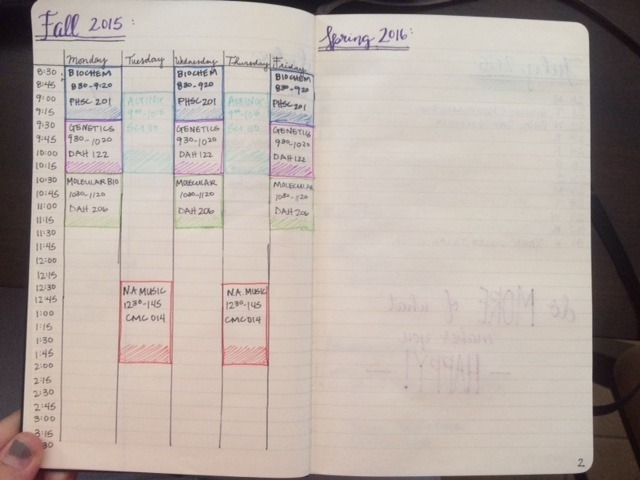 If you're in college, you could even combine all of your syllabi together to create a master syllabi spread in your bullet journal. Thus, you could see every single one of your assignments, project due dates, and quizzes for all of your classes all at once. You could refer to each individual day in this spread to know what you should be doing (homework and studying-wise) on that specific day. I don't know about you, but I have a tendency to buy way more stationery than I really need. Back to school season is an enabler in this respect since school supplies get so heavily marketed. However, if you're not in elementary or middle school, you probably don't have a supply list, and this can easily lead to overbuying. Thus, for the past two years before school starts, I've made myself a spread of the things that I genuinely need for each class or for school in general. This prevents me from getting more stuff than I need. Make sure to not only include stationery, but also things like textbooks, technology, and clothes. 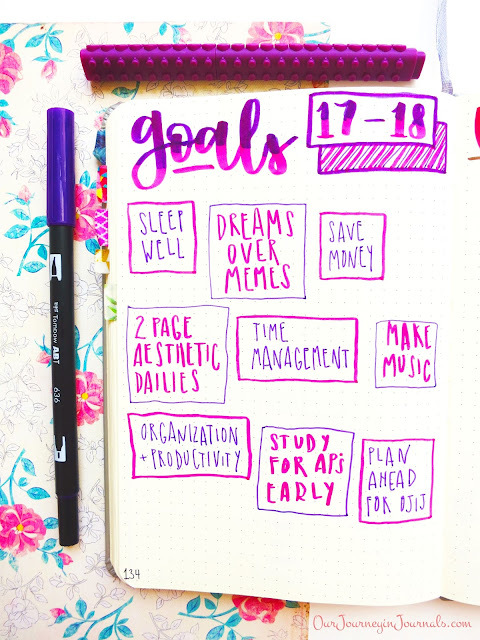 Another helpful bujo spread to create at the beginning of the year is a goals page, whether it be academic or otherwise. I know that there are things I want to change about my life in general - especially when it comes to school, so a new school year is definitely a great time to start some new habits; I highly suggest making a goals spread to start this academic year off on the right foot. Speaking of new habits, I find that using a habit tracker can serve as good motivation, and like I said, this is a fitting time to begin implementing new habits. Not only is it important for your life right now, but assuming you're not already living as an adult in the "real world" (like most students), it's important to set good habits right now when you're still young. I've written a post on tips on using a habit tracker and 60 ideas of things you can track. On the other hand, there are some things that you want to stop doing - such as procrastinating, staying up too late, or comparing yourself to others. Though psychologically it's generally better to have positive commands rather than negative ones, it might help for you to make an "un-to do list". Basically, you make a spread of the things that you want to stop doing. Here's a more in-depth blog post about it by Page Flutter. This is a helpful spread to have if you're in a school or club that requires a certain amount of volunteer hours. To make this tracker, I would suggest making a chart with five columns: one for the date, a short description of what you did or who/what organization you did it for, how many hours, if you got it signed off by the person/group you did it for, and the total number of volunteer hours accumulated. This would more be a layout to create probably a few weeks into the school year, but I find that having a plan written out on paper makes it easier to actually follow said plan; this also applies to an after school routine. In the past, I've had a bad habit of eating snacks for an hour while watching YouTube videos and then taking a nap right after getting home from school (and thus going to bed way too late), so I hope that making an after school routine spread in my bullet journal will aid me in being more productive in the afternoons. These are both spreads that would be set up periodically. I've written a tutorial in the past on how to make a monthly memories spread, but in short, it's a generally more artistically-based spread that shows the highlights of that month all on one or two pages, as the name suggests. The "current favorites" bujo spread, on the other hand, features your favorite music, TV shows, movies, food, etc. at that time - whether it be of that month, those two months, or whatever. They're both fun ways of memory-keeping in your bullet journal, and though I suggest them to everyone (particularly the former), they're especially great for students because there will come a time where you (fortunately?) will not be in school anymore. You will only be young once, and you most likely will never be in school ever again after you graduate. Once you get older, you might want to look back at this era in your life which was both traumatizing and defining of who you are as a person. Unlike the former layouts, these are things in your bullet journal that I suggest making throughout the year just whenever you need them. Something I often do when there's a break (like fall break or spring break) is making a "break work" spread. I have had a bad habit in the past of procrastinating on homework, studying, and things like that when I know a break is coming up soon. Thus, I end up with a huge pileup of schoolwork plus personal projects to do over said break. To help manage that, I write down all of the tasks that I want to do - divided up by category (like different classes, for example) - on one page. It's a lot less daunting to start working on stuff if you can physically see every single task, and it also ensures that you don't do something simply because you forgot about it. In a similar vein, I find it helpful to have a breakdown spread of projects or essays. I write down each step or aspect of the project as a task (plus any deadlines), and this makes it a lot easier to make sure that I complete them. I personally am primarily a visual learner, so it really benefits me to actually see each step of the way and have my plan right in front of me. Or, if it's a more artistically-based project, I sketch out the layouts (like in the above picture). Sometimes, school can get rough, and you get into a funk. A way to make yourself feel better is by referencing a self-care or motivation spread. For the former, I've written out things that make myself feel happier that I don't necessarily get to indulge in all the time. This includes hanging out with my cat, writing songs, and reading for non-academic reasons. For the latter, this could consist of things like quotes or mantras that remind you of why you're going to school in the first place (or the consequences of not doing well or graduating). Something I've done in my own bullet journal before is a "things to remember" sort of spread. Literally right before a test (like in the three minutes before the period started), I quickly drew out a spread of some of the biggest, most important facts of the test and some things that I wanted to make sure that I remembered. This works especially well for math and science classes with formulas, but this would also be helpful with conjugations for a foreign language class, important dates, people, and other terms for social studies, or anything else like this. However, I don't really suggest having full out notes for school in your bullet journal since they would clog up your bujo; a quick review spread should just be something you do on occasion in special cases where you don't have the time to get out loose leaf paper or the subject's notebook (or if just don't want to use up a separate piece of paper). In addition, notes from different subjects would all get mixed up with each other - nevertheless with the rest of your various bujo spreads. When it comes to finals or any other series of big tests (like AP exams if you're in the US), a study schedule is really beneficial for your productivity. This ensures that you actually get around to doing all of the studying that you want to do while scheduling around your already known time conflicts and commitments. Plus, I find it a lot more motivating and simpler to adhere to a plan if you have it down on paper - especially if you can make the spread look cute. This is another bullet journal spread meant for big tests that are out of the norm. Again, I'm talking about things like AP exams, the SAT, or any other important and lengthy test where you're not in your typical classroom location and you can't have your backpack with you (or whatever you typically bring to class). 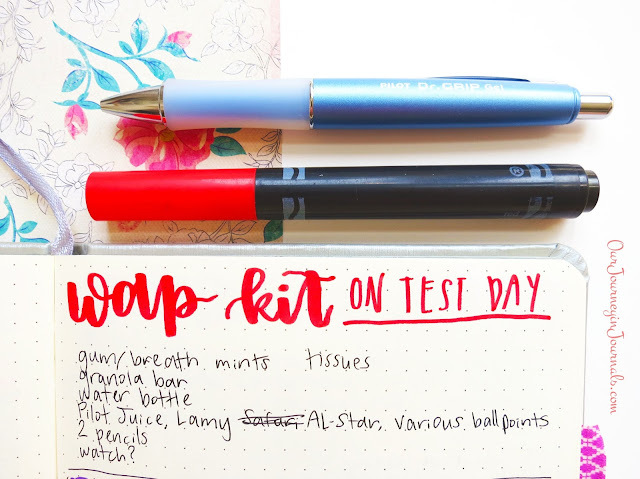 It makes me more confident for the test itself if I write down to remember to bring things like tissues, extra pens and pencils, a big eraser, a watch, a granola bar, etc. Expense tracker spread for August with a place to track my bad habits when it comes to spending. I have a feeling buying too many pens on Amazon might make that list. This is only really necessary if you're in college, but student life can definitely be straining when it comes to money. One method to ensure that you are living within your means it to create a weekly or monthly budget. First, you should try a trial period where you track all of your expenses - groceries, subscriptions and software, recreational spending, savings, bills, etc. - to see exactly how much money you spend in each category. Use these numbers to set a budget, and continue tracking to make sure that you are being financially responsible. It's so beneficial to physically be able to see the amount you're spending, and thus to further encourage yourself to not overspend. Along the same vein, scholarships and other sorts of financial aid is super important to know about, especially if you're a high school senior. You can keep track of different information about these things - like application deadlines and application requirements - all in one place in your bullet journal. Being a student can be tough, but with the help of your bujo, you can get through it! 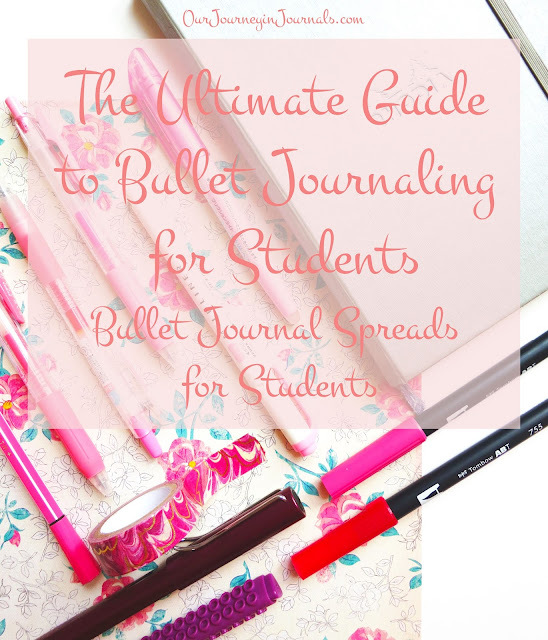 Bullet journaling is such a great tool to help you manage everything in your life, both academic and non-academic, so I hope this guide has helped you in adapting the bullet journal system to your life as a student. Good luck in your future endeavors! 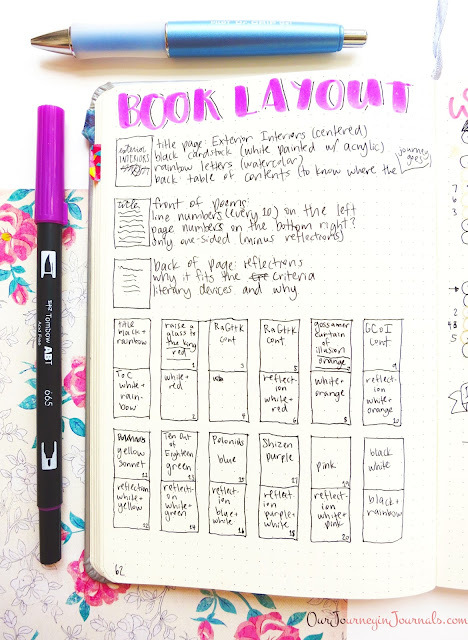 Do you have any bullet journal spread ideas for students or questions about using the bullet journal system as someone in school? Make sure to leave them in a comment down below! If you don't use a bujo already and need further convincing on why you should use one, definitely check out this post. Such a change may well have CENTRAL KENYA noteworthy effect on the advancement of basic and expository abilities ordinarily an extra to the educating of Science.